Bill & Lisa's Sporting Life: LISA CARDS AN ACE! BILL TAKES CREDIT! LISA CARDS AN ACE! BILL TAKES CREDIT! Lisa and I did not anticipate playing much golf on our recent winter holiday to Miami and Key West. Our corgi dog Angus traveled with us, and we were visiting family (Hadley and Yannick in Miami) and friends (Tom and Terese Houle in Key West) who were not going to be playing. But we took our clubs along "just in case." Tuesday, December 27th dawned bright and sunny though a mite cool for south Florida- in other words perfect golf weather! I checked out the Key West Golf Club website and was surprised to learn that the famed Rees Jones had designed the layout. Also getting my attention was the site's description of its "infamous 'Mangrove Hole' (143 yards, par 3) that is played completely over a field of thickly intertwined tropical mangroves." So I convinced Lisa that we should give the course a try. The club paired us with John, retired Air Force and only an occasional golfer. We found the course to be an attractive challenge and I mentioned this to John as we were putting out on the sixth hole. He smiled and remarked, "Wait 'till you get to 8- the Mangrove Hole! You won't believe it!" So it was with much trepidation that we approached the 8th tee. John had not exaggerated. The mangrove growth was such that the shot is semi-blind; only the pin was visible. The shot was all carry! I teed off first playing slightly downwind from a measured distance of 168 yards and though I could not see the result, I guessed that it might be on the right edge of the green not far away. So now it was 24 handicapper Lisa's turn to deal with the intimidating mangrove. I measured her shot at 131 yards. Lisa asked, "What about a 5 wood?" I was concerned that since the shot was all carry, that might not be enough club, and told her so. She said, "OK, I'll hit driver." Her bypassing the 3 wood was no surprise because it is not her favorite club. However, driver was too much club. But this shot is so scary that a player should pick a club in which he (or in this case she) has confidence. And the bunker behind the green (the likely repository if Lisa hit her driver cleanly) was certainly a preferred outcome to the thicket. So driver it was. Because the Mangrove Hole presents such an interesting and beautiful challenge, I elected to take a picture of Lisa's shot as she was going through the motions of her pre-shot routine. Fumbling with my I-phone (yes I finally got one at Lisa's behest in December) I managed to click off a shot of Lisa's well- balanced follow-through. I looked up in time to see her low bullet of a tee shot. Indeed, if you enlarge the picture below, you can actually see the flight of the ball just over the tree line. In the brief moment I observed the ball airborne, I could tell that clearing the mangrove would be a close call. But Lisa struck her screaming shot with authority, and we were relieved to see the hard bounce of her Titleist on the far side. Now at that moment, my assumption was that the ball would careen through the green and settle in the back bunker. Just then, the resounding but unmistakable sound of a ball crashing into the flagstick reverberated back to us at the tee. But the mangrove growth hid sight of the ball's ricochet from our view. There seemed little hope that the ball could have settled near the hole, and indeed when we arrived at the green, it was nowhere to be seen. My assumption was that her Titleist had caromed into the back bunker, but an inspection there revealed no ball! I was disappointed to find my shot had landed in the right-hand bunker- but still no sign of Lisa's ball! Of course, when all else fails, CHECK THE HOLE! 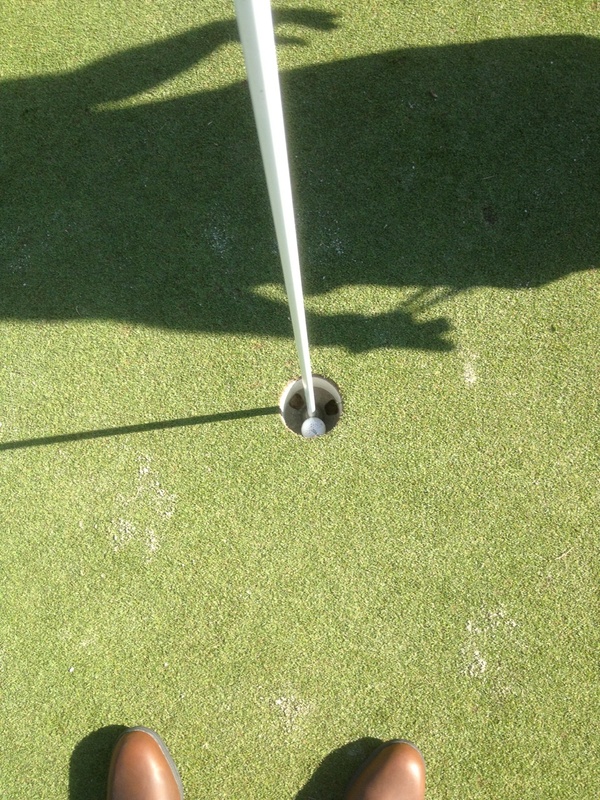 Wonder of wonders, there it was- Lisa's first ace- a truly astounding shot on the signature hole of the southernmost golf course in the United States! After hugging John and me, she did the modern thing and immediately commenced texting her friends. Thus, she missed my sweet (though overshadowed) bunker shot, which fittingly spun in for a 2! I couldn't wait to tell everyone that "Lisa made a hole-in-one, and I photographed the actual shot- (certainly a rare occurrence). I clubbed her too! Oh by the way, I holed my bunker shot after her ace." After hearing this account a number of times , Lisa , I think kiddingly, suggested I was making the hole-in-one more about my involvement than her actual shot. Well, I can't take the credit. After all, it was Lisa who hit this memorable blow, and I am very proud of her. I should add that she kept her composure, and went on to shoot a creditable 96. Did I forget to tell you that it was my idea to play golf that day? Lisa's ace; Key West G.C. (3) two were on courses we had never played before, the third was on a course we had played only once; (4) two of the three aces were holed in Florida even though 95% of our golf is played in Ohio.